The government of India led by Prime Minister Narendra Modi is surely trying hard to bring about overall development in the country and uplift the condition of the citizens. A lot of schemes and initiatives are being launched keeping this development factor in mind and one such scheme is the Pradhan Mantri Krishi SinchaiYojana. Now there are many instances that have come to light that shows that the resources of the country are not being well or properly utilized. But then the proper utilization of the resources is very important as it makes sure that there is no wastages nor there is any lack resource in a certain region. So the main focus of the Pradhan Mantri Krishi Sinchai Yojana is to focus on the proper use of the resources of the country, especially water. Scheme launched by Prime Minister NarendraModi. 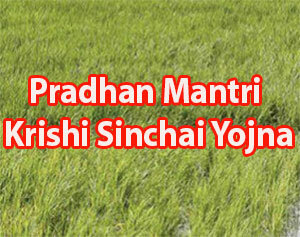 The Pradhan Mantri Krishi Sinchai Yojana is a scheme that has been made by bringing together all following scheme and programs. The scheme includes Integrated Watershed Management Programme of the Ministry of Rural Development, Farm water management component of the National Mission on Sustainable Agriculture and the Accelerated Irrigation Benefit Programme of the Ministry of Water Resources and River Development & Ganga Rejuvenation. So the plan here to bring all water and irrigation related scheme below one roof and bring about a better and more organized level of planning and executing projects. The scheme will bring together all the ministries, agencies and institutions that are involved in water management and irrigation system of the country. The main objective of the scheme is to attract more and more investment in the irrigation system at the field level and provide solution to all the irrigation relating problems. The scheme aims on promoting the use of micro-irrigation methods such as sprinklers, pivots, drips, rain-guns, etc. The use of advanced technology will also be promoted. The concept of water conservation and recharge of aquifers will be promoted under this scheme. Also the possibility of use treated municipal waste water for peri-urban agriculture will be thought upon. The scheme would also focus on making sure that all the field and farms of India have accessibility to the water for irrigation and also increase the cultivable area. So basically with this scheme the government of India wants to bring about an agricultural system where they is enough water for irrigation and all the latest technology is used for the same. But at the same time there should be no waste of water instead full effort should be made on saving as much water as possible. For this schemethe government has allocated Rs.50000 crore for the coming five years. And in the budget of 2015-16, Rs.5300 crore was allocated for this scheme for that particular financial year. This scheme will allow states to come up with various irrigation plans for the betterment of the agricultural sector in their state. And then the funds will be allocated to the states. National Steering Committee (NSC) of PMKSY under the leadership of the Prime Minister will manage the scheme and see the implementation of it. Under this scheme the District Irrigation Plans department will be responsible of identifying the gaps in the irrigation system and then try and fixing it. All the projects under this scheme would be scrutinized by the State Level Project Screening Committee (SLPSC) and sanctioned by the State Level Sanctioning Committee. And the funds under this scheme will be allocated to the states only if they are able to provide a proper district or state irrigation plan. Under this scheme the government will be giving 75% of the total fund required as a grant and then the rest 25% will have to be managed by the state government. But for the north eastern states the state will have to bare only 10% and the 90% will be given by the central as a grant. As stated above all the states and union territories of the country can avail the fund that have been allocated for the scheme. But then for doing so the state has to come up with a full proof irrigation plan for the state and list down the benefits of the plan and how it would help in the proper management and usage of water and other resources. In the plan it has to be clearly explained that how the state plans on doing a sustained and effective agriculture and use water in the right way. If the plan is meets all the measures of the scheme then it would be considered for being a part of this scheme and 75% of the total money required will be allocated to the state. Accelerated Irrigation Benefit Program– there are main irrigation related projects that are going on in different parts of the country, some on the national level and some on the state level. Under this scheme all the Major, Medium and National Irrigation Projects will be pushed for a faster completion so that new projects can be started. The pace of the work would be increased and the aim would be complete the projects much before the estimated dates of completion. Har Khetko Pani– This is another major component of the scheme. Har Khetko Pani means water to all fields and all the name suggests the focus here would be to provide irrigation facility to all the fields of the country. This component of the scheme would focus on developing new water sources through minor irrigation. This component of the scheme would also focus on increasing the strength of the traditional water sources, and the construction of the rain water harvesting elements. Apart from this focus would also be laid upon the repair and restoration of the different water bodies. One of the main focus of this component would also be in the developing or bringing back the traditional water storage systems such as Khatri of Kuhl, Himachal Pradesh; JalMandir of Gujarat; Ooranis Tamil Nadu; Dongs of Assam; Zabo of Nagaland; and other similar storage systems. The overall development and management of the ground water will be taken care of. Watershed Development– The watershed development component of the scheme would take care of the themanagement of the soil and moisture conservation along with managing runoff water. The main activites in this component would include rain water harvesting, ridge area treatment, and many others. Per Drop More Crop-per drop more crop component of the scheme would focus on the building of water conveyance devices including pivots, rain-guns, drips, etc. This scheme by the India government is quite promising and the best part about it is that it has brought all the irrigation relating scheme under one roof. This makes the management of all the scheme much easier and analyzing the effectiveness of the schemes also becomes convenient. But then it is a widespread scheme and involves a lot of factors in it which makes it difficult to be implemented. But from the time of its launch, till now the scheme has surely gained quite some popularity and many states have shown their interest in this scheme. There are a lot of farmers in the country who are being benefited by this scheme. As a part of this scheme the state and the central government are recognizing different districts and areas where farmers are suffering due the lack of water for irrigation. Plans are being made to meet this demand of water for irrigation and new and sustainable ways of irrigation are being established and adopted. Each village that was suffering because of the lack of water for cultivation, are being provided with means of irrigation so that they can pursue agriculture in their fields. But then there are still many regions in the country who are still suffering from the lack of water and it is important that the scheme is managed well so as to reach these farmers as well. One has to wait longer to see that how the scheme does on the long run and if it is able to meet its objectives in the coming years.